There are signs that Apple's dominance of the BYOD market might be slipping from its grasp after US-based long time user Delta Air Lines ditched the iPad in favour of Microsoft's Surface 2 tablet. As reported by Computing, Delta Air Lines' director of IT, Darrell Haskin, has suggested that the firm is phasing out its pilots' use of iPads and replacing the Apple devices with Microsoft Surface 2 tablets. Like many companies, Delta brought in the iPads to replace paper-based flight kits. 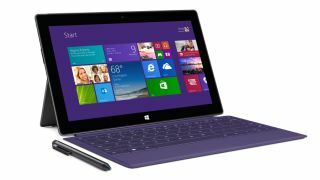 Speaking at Microsoft's Dynamics Convergence 2014 conference in Atlanta, Georgia, Haskin told the media it planned to roll out 8,000 Surface devices and will tell other pilots to come off their iPads as the Surface will be mandatory. Haskin admitted that Delta Air Lines had anticipated a "pushback from employees" but it turned out that they were not sad to see their iPads go because they could not do as much. "When you compare the Surface 2 to the [iPads] they don't have the same capabilities. One example is the split screen, which pilots could use to look at the manual and the weather at the same time," Haskin said. The question for Apple now is whether this marks a trend away from iPads being the tablets that most employees want.